What Is the Advantage of Using the Very Latest Technology? By using the most advanced technology, Dr Poulos can diagnose any problems more quickly and more comfortably, so you can get the essential treatment required that much sooner. 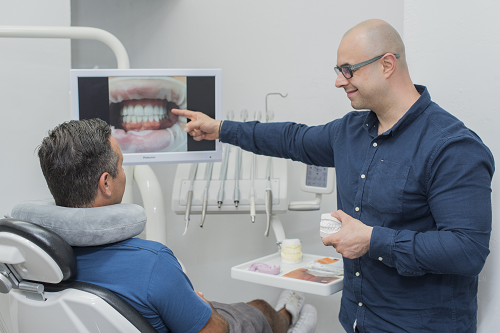 An intra-oral camera provides detailed images of the inside of your mouth, enabling Dr Poulos to show you the problem and to explain all possible treatment options. DIAGNOdent can detect the very earliest signs of tooth decay, allowing us to provide appropriate treatment to protect and preserve your tooth at a much earlier stage than would be possible through a normal visual examination. Our cone beam CT scanner is another highly useful piece of equipment that is essential in planning dental implant treatment, as it provides extremely detailed 3-D images of your teeth and jaws. Dr Poulos uses these images to determine if you have sufficient bone for successful treatment, and to decide exactly where to place each dental implant using image guided surgery. This ensures that your dental implant treatment will be quicker, smoother and more successful. Dr Poulos has an advanced Waterlase dental laser that is capable of treating both soft and hard tissues in a way that is more comfortable and which provides patients with faster healing and fewer side-effects.